A man was shot by a Dallas police officer early Friday morning after he pulled out a gun and pointed it at an officer, police say. Police said the man, whose name has not yet been released, was holding several people hostage, including his ex-girlfriend, inside a residence on the 3800-block of Casa Del Sol Lane. Capt. Jack Bragg said officers responded to the 911 call and heard a female voice coming from inside the home pleading for someone to put down the gun. Officers confirmed the man was holding his relatives hostage, including several small children. With the man refusing to come out of the home, SWAT was called in to assist. After convincing him to release the hostages, the armed man stood at the front of the house with the gun to his head before retreating into the home, police said. The man then tried to exit the garage where he ran into two officers, Sr. Cpl. Phillip Rhodes and officer Kyle Hubert. When he saw the officers, he pointed the gun at them, police said. Fearing for their lives, the officers fired at the man, hitting him. “He was confronted by officers as he was leaving, pointed a gun at officers, and they fired,” said Bragg. How many shots were fired and whether the suspect fired any shots was not immediately available, Bragg said. A different officer told NBC 5 that the man did not have a chance to open fire on the officers. The man was later transported to Baylor Medical Center in stable condition. No one inside the home was injured. Dallas police said the man previously lived at the residence and that he and his ex-girlfriend have a child together. The man will be charged with two counts of aggravated assault - family violence and two counts of aggravated assault on a police officer, police said. 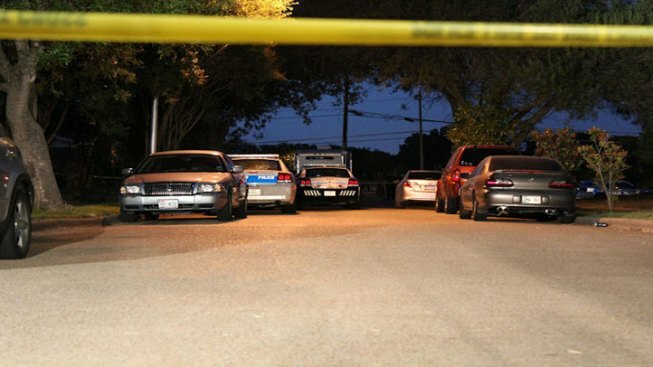 The shooting is the second in as many weeks involving a Dallas police officer. and the 9th of the year. Rhodes and Hubert are on paid administrative leave while the shooting is investigated.